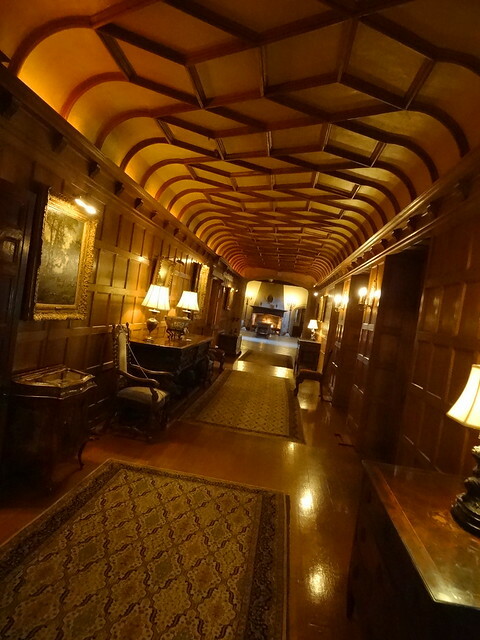 It had been a couple of years since our last visit to Meadowbrook Hall in Rochester MI. 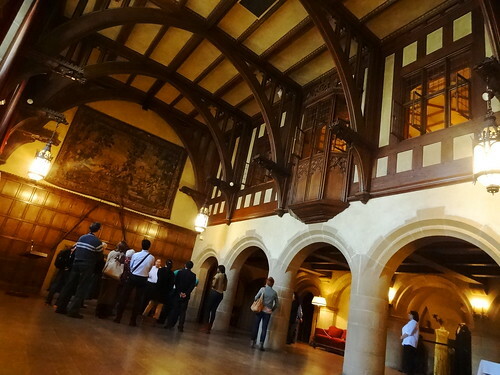 One of this country’s finest examples of Tudor Revival architecture it should be on your Must Do list. 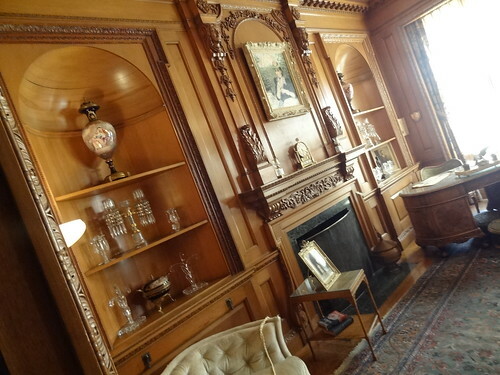 Before I talk about the home itself I need to lay a little groundwork, it all begins with the Dodge Brothers……..
John and Horace Dodge were automotive pioneers who shaped Detroit’s early automotive industry. They went from working in local machine shops, to manufacturing Evans and Dodge bicycles to opening their own machine shop in 1901. Interestingly enough (at least to me it is) they began producing stove parts (remember at one time Detroit was the Stove Capital of the US), then moved on to parts for the auto industry. Their first major customer was Ransom E Olds, in 1902 Henry Ford hired them to produce everything except the body, wheels and tires for his new vehicle. At that time Ford was short on cash, he gave the brothers 50 shares of stock in the new Ford Motor Company as payment, making them 10% shareholders in the company. In 1913 John Dodge decided not to renew their exclusive contract with Ford, John stepped down as President of the company and the brothers began the process of building their own “Dodge” vehicle. In November 1914 the first Dodge rolled of the line in Hamtramck. John was a widower and father when Matilda Rausch, secretary for the Dodge brothers, caught his eye, the two were married in 1907, the marriage produced three children. In 1920 John died of influenza, leaving Matilda a (unbelievably rich) widow at age 37, at that time he was worth in excess of $100 million dollars. 1925 was a big year for Matilda, she married Alfred Wilson and she and Anna Dodge sold their holdings in Dodge Motor Company for $146 million dollars, making Matilda one of the wealthiest women in the world. 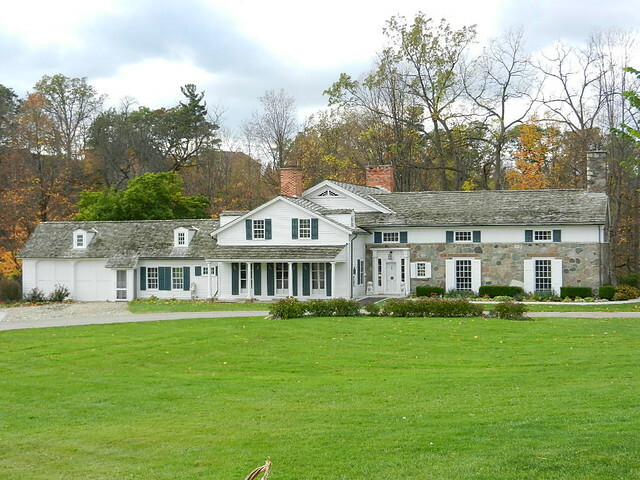 John and Matilda had purchased a farm estate in Rochester MI years earlier as a weekend retreat, it consisted of 1500 acres and several residences. This is where Matilda and Alfred would build their family home. 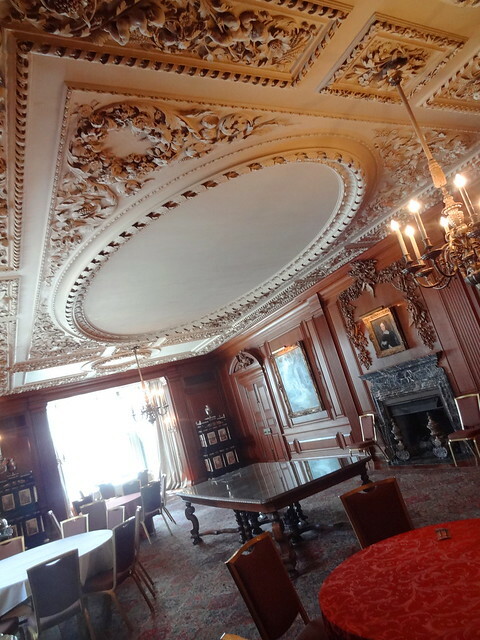 William Kapp (Music Hall, Players Clubhouse) of Smith, Hinchman and Grylls was hired to design the house, Matilda requested the home be large enough to entertain 250 people and the dining room be able to hold 40 people for dinner. What she got was a magnificent, 88,000 sq ft castle, (that’s right, 88 thousand square feet) reminiscent of an English country manor home. 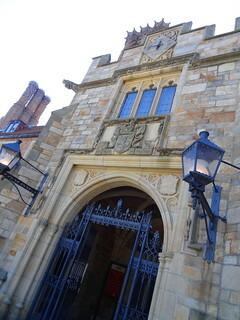 It was built between 1926 and 1929 for a cost of $4 million dollars. Matilda insisted that all materials should be American as well as the workers. 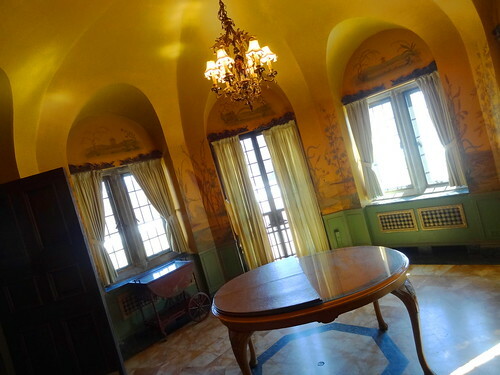 The home is filled with elaborately carved wood, stone, ornate plaster, even the details have details, 27 fireplaces, 39 chimneys and lots of Tiffany glass; she was the largest purchaser of Tiffany in the country. 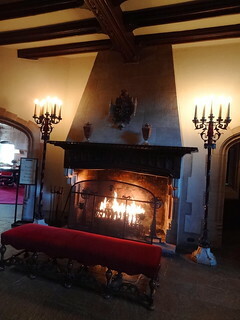 Ok, now we can go in…..
We enter the home and find ourselves in the expansive foyer, a fire burns bright in the massive fireplace, a bench pulled close for those who wish to warm themselves, a pair of candelabra torchieres flank the fireplace. The tour begins on the lower level of the home, the entertainment floor, so to speak. Ralph, our guide begins by telling us a bit of family history and how the house came to be. 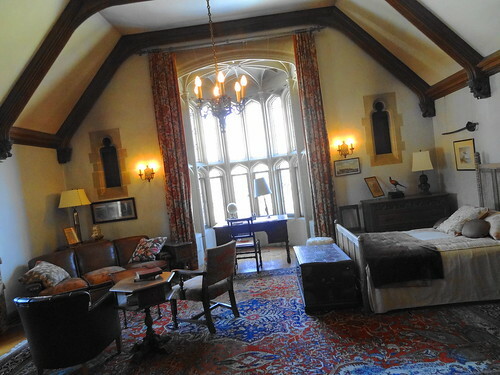 We move into the Ballroom, the only 2-story room in the house, to me it looks straight out of a castle; gorgeous timber ceiling, stone arches, tapestries, light fixtures of wrought iron and glass, almost medieval. The Wilson’s spared no expense when they threw a party, Tommy Dorsey and his orchestra played here with a then unknown singer named Frank Sinatra. 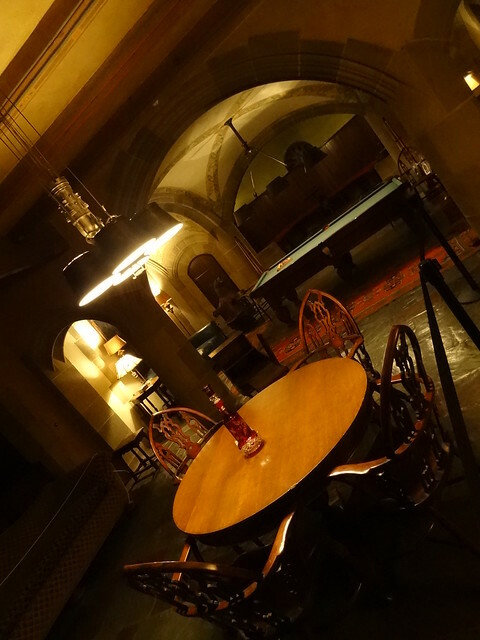 Proceeding through the room we find ourselves in the Game Room; this is where the men would go to smoke, drink, play cards, that sort of thing. The ceiling is vaulted, windows are leaded glass, the slate floor gleams, beautiful rugs and leather couches make the room feel comfortable. 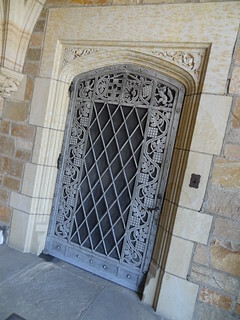 As with every other room in the house it is finely detailed, trim work surrounding the door is carved with shapes of chess pieces, card suits and the like, my favorite detail? The miniature pool table that serves as a door handle! Back on the main floor we find ourselves in the Christopher Wren Dining Room; named after the English architect for the design style. 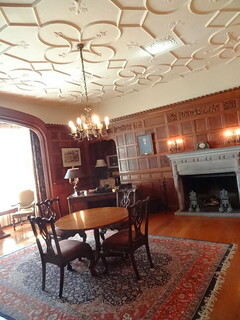 Walls are paneled in walnut, the ceiling, well, it is absolutely stunning. I have never seen another one like it, the work of Corrado Parducci, the detail is magnificent, thick plaster designs hang heavy from above; corn and wheat so detailed you can see the grains, the cherubs have eyelashes, leaves and flowers wrap the perimeter. 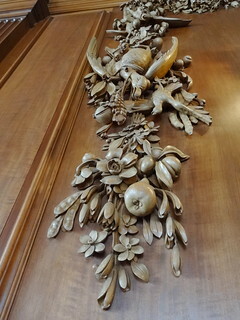 An amazing garland of fruit, flowers and game birds hang above the fireplace, two large chandeliers anchor the room. Family photos are found throughout the house, portraits of Matilda and Alfred hang prominently. Through a narrow doorway is the Pagoda Room, this is where the children would take their meals; walls are hand-painted, lots of windows let in the natural light, an Asian-style chandelier hangs above, it’s wonderful. 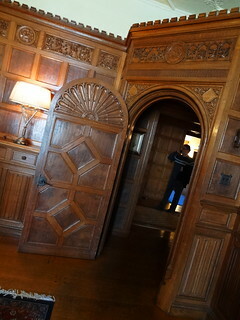 Down the hall we enter Alfred’s study, this is the only room in the house that does not feature American wood, being a lumber baron, he chose English Burled Oak to cover the walls. 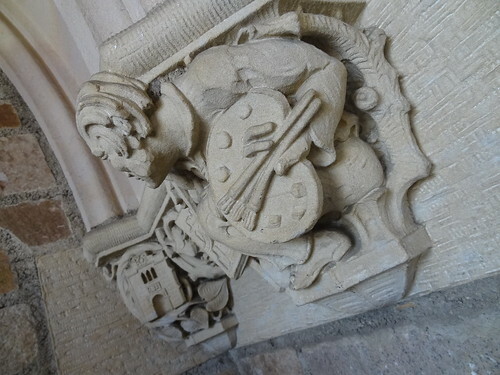 Rectangular panels are carved with scenes representing Alfred’s life from his days in Indiana through college and beyond. 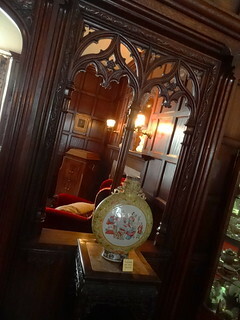 A fireplace makes the room cozy, the detail in the door is impressive, and what kind of door handle does Alfred have? A log of course. As we walk toward Matilda’s office a window offers us a glimpse of the ballroom below, what a sight! 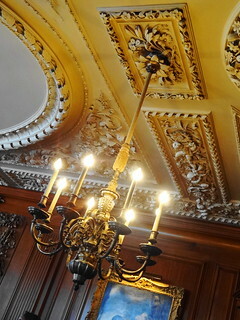 The office is lit by a Waterford Crystal chandelier, a fireplace and desk take up residence in the space, alcoves recessed into the paneled walls hold decorative pieces. 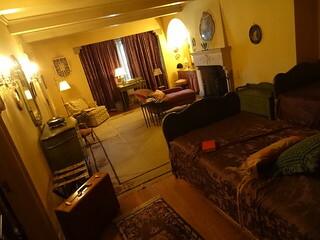 The room looks quite comfortable, it is clear Matilda had a good eye and knew what she wanted. 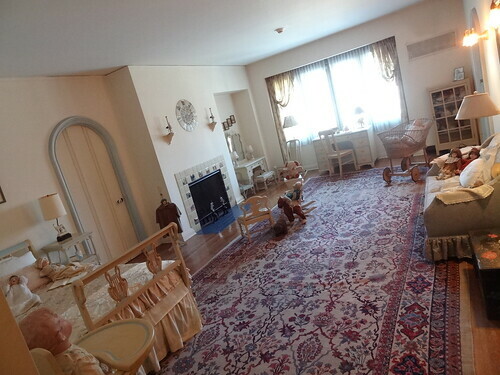 The living room is the largest room in the house, at 1340 sq ft it still manages to feel welcoming and warm. 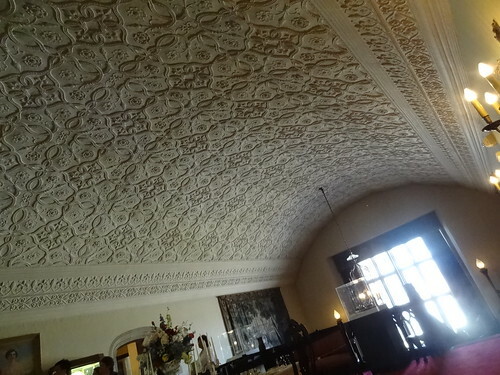 The furniture is Chinese and looks perfectly at home in the room, I love the ceiling, it is bowed to prevent cracking, the plaster pattern is lovely. 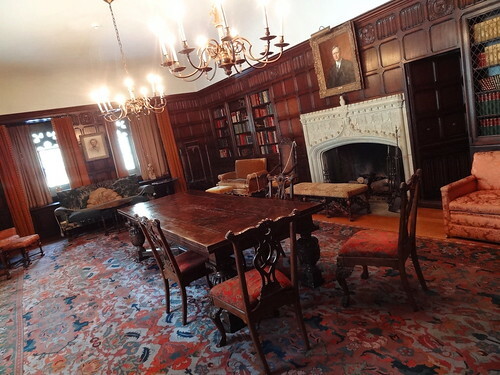 At the far end of the room is another huge fireplace, behind it is a splendid sunroom; lots of windows, the ceiling is Wormy Chestnut, pretty furniture, I can see myself reading a nice thick book in this room. 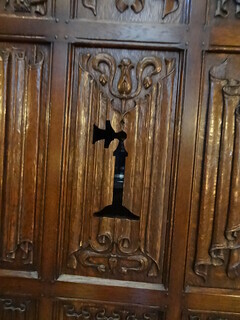 At the opposite end of the room a grand piano sits off to a corner, organ pipes are concealed in the walls, open grates our only clue to what lies behind the wall. 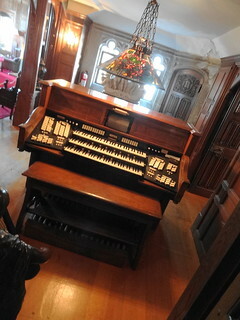 A narrow hall leads us past the original organ, the floor is wide plank, the organ is both a player organ and can be played by hand; paper organ rolls are kept in boxes behind glass doors. 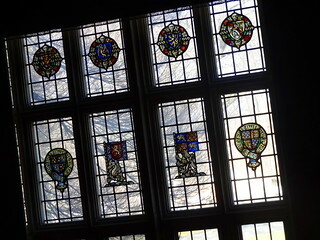 A charming set of three stone windows catch my eye as we pass heading into the library. 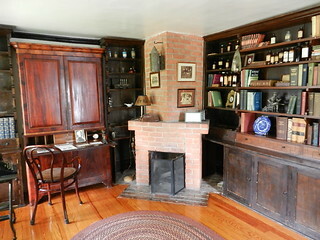 One of the (many) amazing things about this house is that the furnishings are all original, the books actually belonged to Alfred and Matilda, the photos are real family photos, their dishes and personal belongings are all here for us to see! 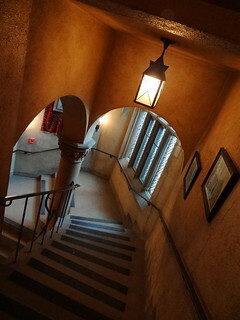 Our group climbs the grand staircase to the Great Hall, great is an understatement. 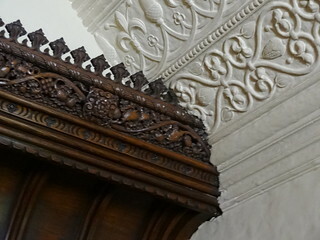 At the top of the staircase I turn around to face the fabulous stained glass windows, from there I look up at the plaster barrel ceiling intensely covered in a brocade-like pattern, wow! A table is set as an example of how the Wilson’s entertained. 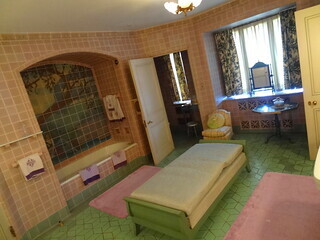 To the right down a hall is the wing where the Dodge children’s bedrooms are located, bathrooms are Rookwood Tile from Cincinnati, guest rooms allowed for them to have friends stay over. 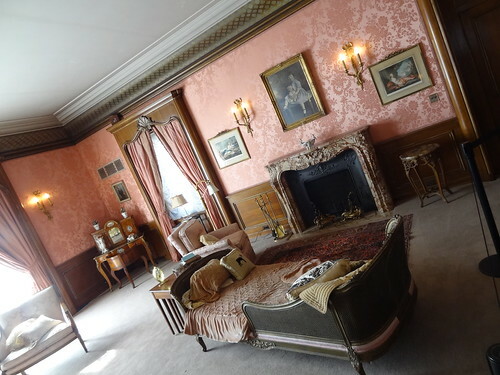 The opposite wing belonged to Matilda and Alfred, each had their own room, Alfred’s masculine as expected, and for the lady of the house, French and feminine. 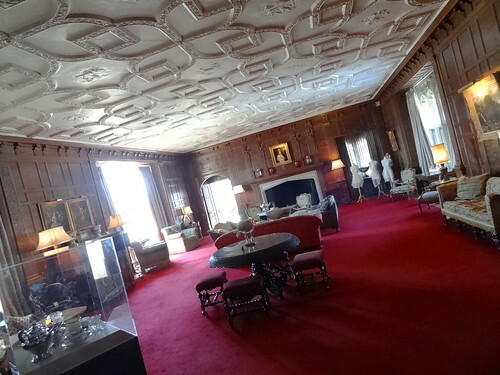 Rose-colored silk wallpaper covers the walls, her bed rests upon a low pedestal, it is exquisite, if I heard correctly, she has 14 closets…..Also located in this wing are the bedrooms of the Wilson’s two adopted children Barbara and Richard, along with the nanny’s room. Both Barbara and Richard are still alive, Meadowbrook Hall turns 85 this year, a celebration is planned and the children are hoping to attend. Matilda was very active in civic affairs and the arts, generous with her time and fortune, she built the Wilson Theatre in Detroit, now known as Music Hall. 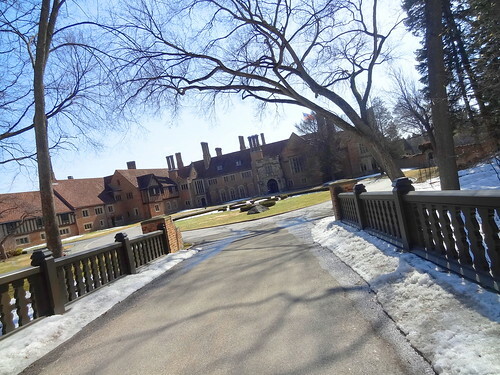 In 1957 Matilda and Alfred donated their entire 1500 acre estate, their collections and an additional $2 million dollars to found Michigan State University-Oakland, renamed Oakland University in 1963. 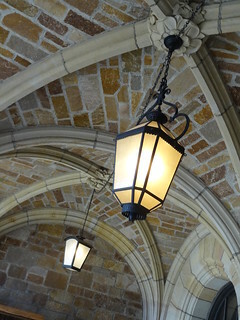 The university opened in September 1959, 570 students enrolled that year. Upon graduation Matilda presented each student with a diamond ring. The Wilson’s continued to live at the estate until their deaths, Alfred in 1962 and Matilda in 1967, today, their legacy lives on. 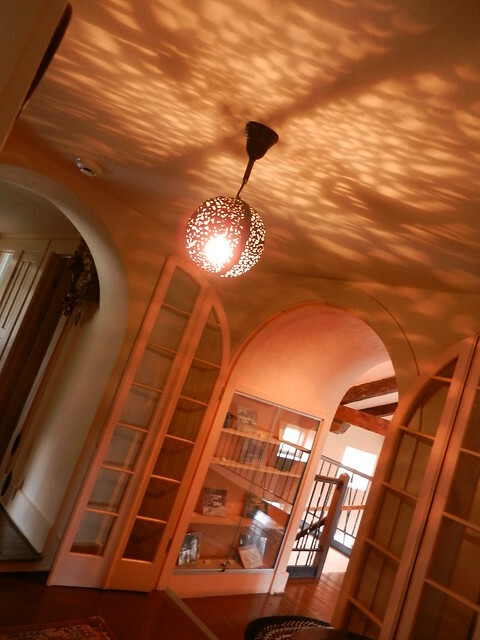 It’s nearly impossible to capture the beauty of this home in pictures, descriptions cannot do it justice, you’ll just have to see for yourself. The Royal Park Hotel in Rochester seemed like the logical place to have lunch, the boutique hotel which opened in 2004 is also designed in the English Manor House style. 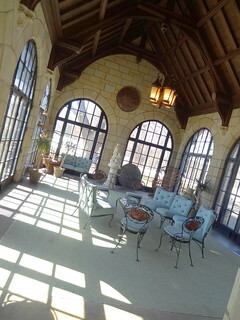 The exterior is brick and stone, inside you will find dark wood, rich fabrics, oriental rugs and fireplaces. 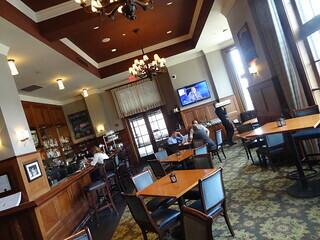 We take a seat in Elliots Lounge, the menu features casual meals, sandwiches, salads, charcuterie and cheeses. We start off with the specialty sausage board; a grilled chicken and organic apple sausage served with watercress salad and sundried pear and apricot mostarda, yum! 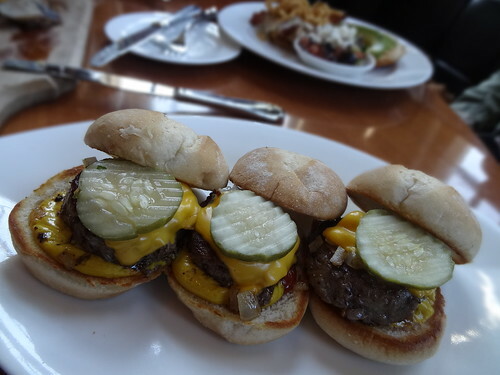 Kris digs into the RPH Sliders while I enjoy the Chili Lime Chicken sandwich, everything is well prepared and delicious, service is excellent. When we have finished, we leave the world of the rich and famous and return to reality………bummer. It’s already mid-October and we haven’t nearly had our fill of cider and donuts. Fortunately southeastern Michigan is laden with wonderful apple orchards and cider mills. 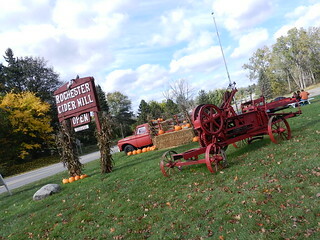 The Rochester Cider Mill on N Rochester Rd has been treating families to delicious apple cider for over 30 years. When you are here you feel as though you are out in the country, but in reality you are only about 2 miles north of downtown Rochester. 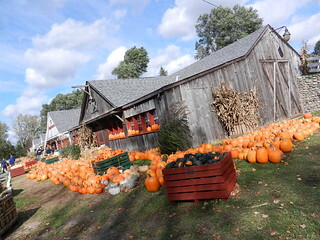 The rustic wooden building with it’s red trimmed windows and doors greets you with a huge array of pumpkins in all shapes and sizes across the front. 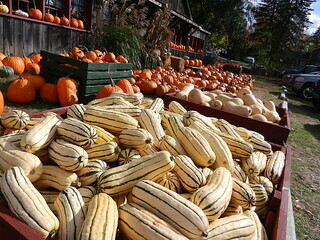 There are large red wooden bins overflowing with pie pumpkins, acorn squash and the biggest butternut squash I have seen. On the right side of the building is a petting farm and play area for children. 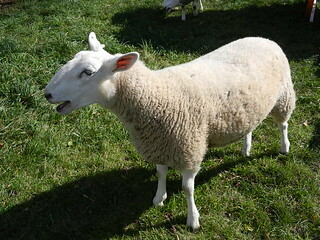 We opened the gate to find about a half dozen sheep roaming around. They are initially excited to see you in hope that you have brought them something to eat, we did not, so we didn’t hold their interest for too long. There was a chicken coop filled with rust colored birds clucking among themselves as we looked in on them. The cider mill sells fresh eggs, so I imagine these are the chickens providing them. Inside you are taken with the aroma of fresh apples, cider, and fried donuts, the quintessential perfume of Autumn. 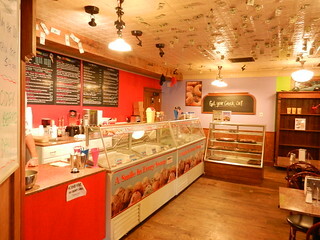 They have a lot to choose from; donuts come in plain, cinnamon sugar, powdered sugar, blueberry, chocolate glazed, and our favorite maple glazed. The maple donuts are so delicious, you have to try one (or a whole dozen) ! They also make apple crisp, and pies, everything is homemade. Caramel apples, Michigan made maple syrup and honey is also available. Be sure and walk around a bit inside; beautiful Autumn displays decorate the space. Haystacks are piled up high and adorned with brightly colored mums in full bloom and gourds in funky shapes and colors. Bunches of Indian corn hang along the wall side by side with antique farm tools. 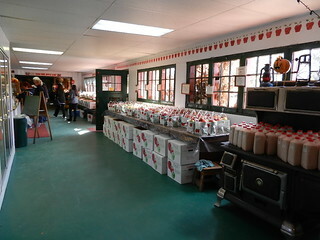 Long tables topped with white paper bags spill over with several varieties of fresh picked apples. 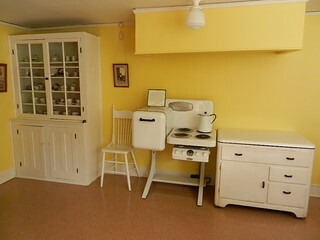 A vintage stove holds half gallon containers of home grown popcorn, they have something for everyone. After you have made your purchases have a seat outdoors at one of the picnic tables to enjoy your cider and donuts in the fresh country air. 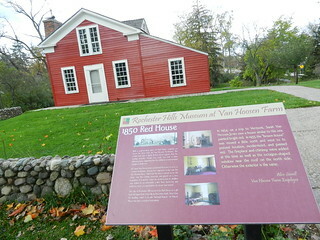 The Rochester Hills Museum at Van Hoosen Farm is located in what was originally Stony Creek Village. Avon Township, which is now Rochester and Rochester Hills is the oldest community in Oakland County. 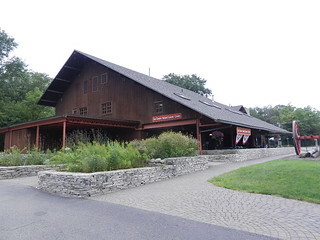 The first settlers came from New York and New England, this was a typical farm community made even more attractive with the close proximity of the Clinton River, Stony Creek and Paint Creek, the museum shares with us the history of Rochester. The 16 acres of grounds are lovely, and it doesn’t get better than this time of year with the trees draped in reds, golds and oranges. 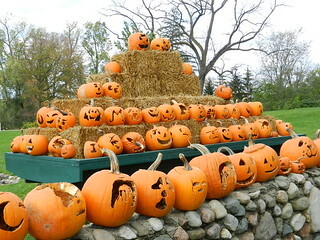 In early October Van Hoosen farms hosts their annual Stonewall Pumpkin Festival. Everyone is invited out for a day of pumpkin carving and fun. Then from 7-9pm the pumpkins are lit and placed on the stone wall, it is quite a sight! Many folks leave their work of art on display and the museum leaves them out for all to enjoy, I love going out there and checking them out. 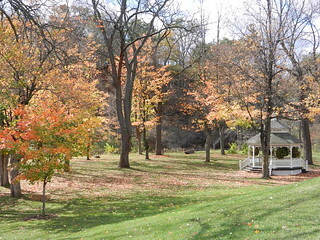 You can take a stroll along Stony Creek, or have a seat under the gazebo; the scenery is picturesque any direction you look. 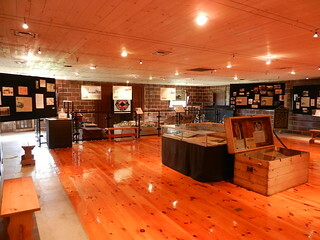 Start your tour in the museum, for a small fee ($5.00 for adults), you can visit the museum and tour the farmhouse. You have to plan it though, as home tours are given at 1:30 and 3:00 Friday and Saturday only. 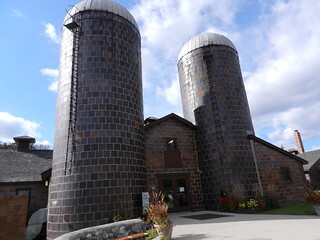 Located in what once was the dairy barn,the museum is top-notch; gleaming knotty pine floors and wonderful exhibits take you back in time to when mills were water-powered and ground your grain into flour. A lot went on in this town, can you imagine back in 1907, 8 passenger trains and 25 freight trains stopped in Rochester every day? Van Hoosen Farm produced and sold milk and other dairy products such as ice cream, and cottage cheese. It’s a very interesting museum to visit, no matter what area you are from. The farm house tells the story of 5 generations of the Taylor-Van Hoosen families, the women in this family were amazing! 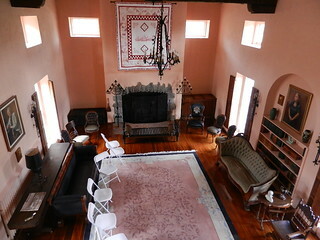 The house itself was built in several stages through the years, it has been maintained perfectly and is simply charming. 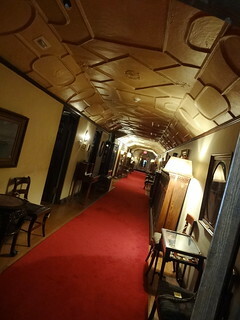 The building itself has been restored, most of the furnishings are original. Pictures on the walls put faces to the names of the families who lived here, items they picked from travels and from past generations reflect who they were. A tour guide takes you through the timeline of the home and its occupants. Both Bertha and Sarah were strong women; ahead of their time, they changed the world and how it did things. The house is filled with little details; electricity in unexpected places , hidden doorways, and fascinating tales. It’s a great way to spend an afternoon. Downtown Rochester has changed through the years, but still has that old fashioned appeal. Restaurants, shops and galleries line Main Street, so when it comes to eating, you have several options. 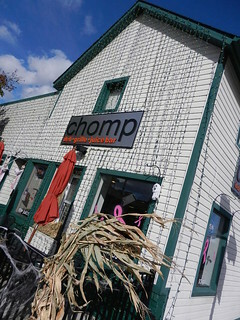 We chose a place at the south end of town named Chomp. Family owned, this deli, grille, and juice bar has been opened for about a year now. Classified as “healthy” fast food, the menu has tons of choices from soup and salads to sandwiches and burgers, with plenty of vegetarian choices in the mix. Ok, the Avocado Burger sound too good to pass up, so we ordered it. Kris really, really wanted the fries, but I had too much guilt from the donuts we ate earlier in the day, so we had the classic salad instead. The burgers are made from sirloin and cooked to order, ours was topped with avocado, bacon. 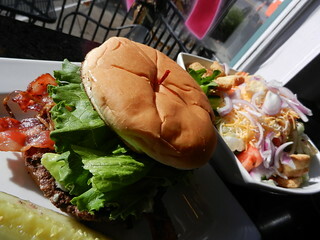 blue cheese, sauteed onion, lettuce and tomato; thank goodness we got the salad, right! We enjoyed both items, sitting on stools along the counter facing Main Street. There’s something fun about a window seat where you can look out and see what’s going on. What do you like to do on a rainy Summer day? We got off to a late start on Sunday so we began our outing with lunch. Red Knapps Dairy Bar has been a staple of Main Street Rochester since 1950. I have been coming to this place all my life and enjoy it just as much now as I did when I was a kid. 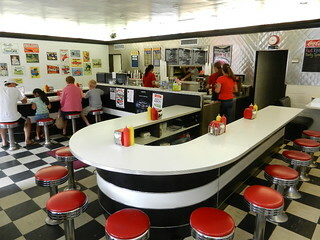 The decor is authentic kitschy diner, I like to sit at the dairy bar on the vintage red barstools. 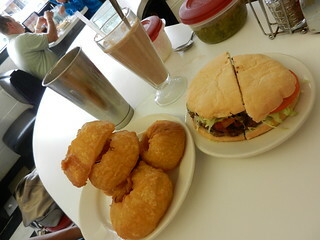 The food is exactly what you’d expect; burgers, fries, onion rings and of course shakes and malts. The burgers are large here; they’re not fancy but you can dress them up with a variety of toppings, onions and relish are delivered to you in tupperware containers. You must try the onion rings, they are massive in size; cut fresh to order, battered and deep fried, they are the best we’ve ever had, one order can easily feed two. I much prefer a malt over a shake, but you can’t go wrong with either here, flavor choices go way beyond vanilla, chocolate and strawberry; how about mocha, peanut butter or butterscotch? I order mine double chocolate (made with chocolate ice cream) and extra malt, you don’t get malts like this just anywhere. It arrives at your table in a tall old fashioned glass with both a spoon and a straw along with the remainder left in the shiny metal mixing container, you can easily get another full glass out of it. Knapps is still owned by the family, Red’s son Gerald and his son Miles are in charge now and they still do things the old fashioned way, and we’re all glad for it. 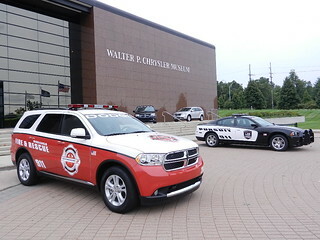 With the anticipation of the Woodward Dream Cruise in the air, we paid a visit to the Walter P Chrysler Museum in Auburn Hills. The 55,000 sq. ft. museum is spread out over three floors and has something for everyone. Cars have always been more than just transportation, they tell the history of America and what was going on in the world, they reflect the fashion of the times and the way people lived. 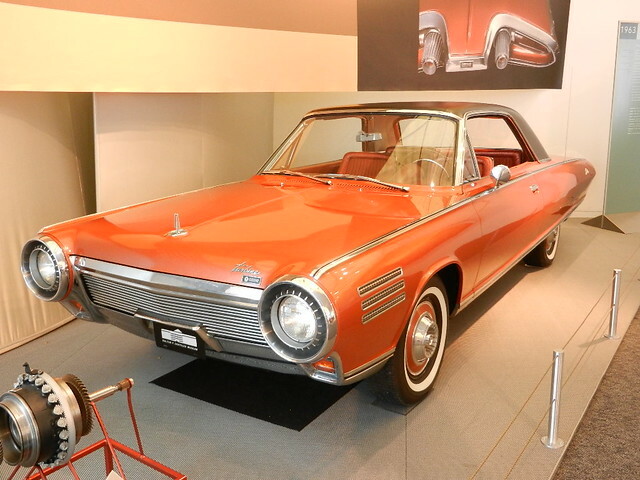 Historical exhibits explain the significance of the more than 65 vehicles, and take you through the timeline of the Chrysler Corporation. 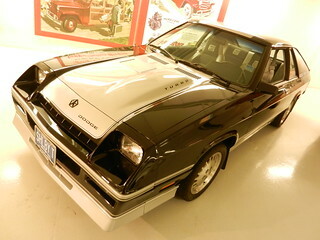 The cars themselves are gorgeous; huge chrome bumpers, mouldings, and grills. Two-tone paint jobs in pink and cream, high impact colors like Sublime, Plum Crazy, and Vitamin C, and don’t forget wood-grain. 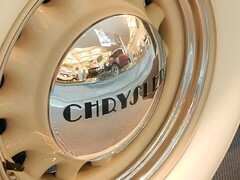 Every decade is represented here; From Chrysler’s inception in the mid 20’s to the Art Deco styling of the Air Flow, right through WWII to the fabulous fins, chrome and colors of the 1950’s. 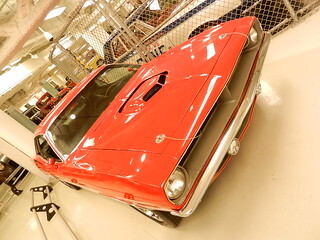 Next up Muscle Cars with their stripes, scoops and spoilers; names like RoadRunner, Challenger and Super Bee. I love the clever marketing terms used in this era, a language all it’s own; Mod Top, Air Grabber,Tuff Wheel and Shaker! Would you like your ‘Cuda with a Pistol Grip or Slap-Stik shifter ? Hood pins or rear window louvers your style? Paint it Sassy Grass Green or Moulin Rouge, it was all up to you. 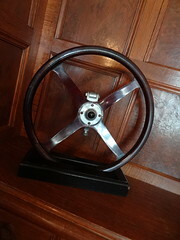 Then continuing into and out of the gas crunch with the Cordoba and Volare, K car, Shelby’s and Mini Vans. Then we arrive at the present with the gorgeous 2011 Dodge Challenger and Charger, I wish I could take them all home. 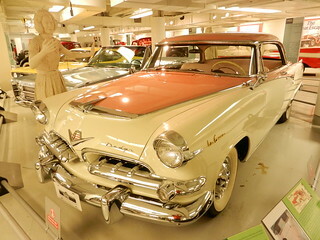 Downstairs in addition to race cars and Jeeps you will find one of my favorites the Dodge La Femme, specifically designed for women, this vehicle came with a matching umbrella and handbag, how cool is that! 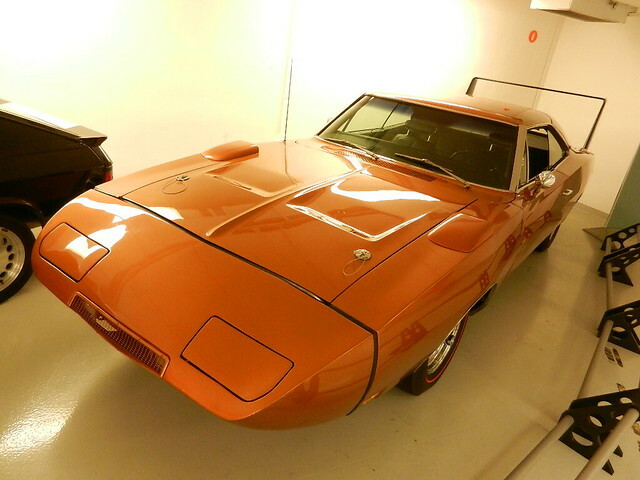 Kris has a great passion for cars and while he was initially attracted to the Muscle Cars, and he’s had his share, we have both grown to like and appreciate cars of all eras. When we travel we always like to go to the ‘local’ museum, it allows you to get a real sense of the people and the significance of a place when you know more about them. The same can be said of the Chrysler Museum and Detroit, this city put the world on wheels, we have a truly amazing manufacturing history, one that we can all be proud of. They did a great job with this place, you can easily spend an hour or more just looking around. When we left the museum we made our way over to scenic Orion Rd to get an ice cream at the Historic Paint Creek Cider Mill. Located just off the Paint Creek Trail they are now open 7 days a week. Inside you can choose from a wide variety of flavors of Hershey’s Ice Cream, try the Cappuccino Crunch; coffee flavored ice cream with bits of crunchy toffee with deep chocolate fudge running through it. Yes, they have donuts even in Summer , how about a Maple Bacon? The massive covered porch allows you to sit outdoors even if the weather is less than ideal. We enjoyed our ice cream and the peaceful setting, before you know it the leaves will be turning and lines will be out the door!